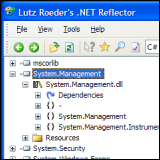 Reflector for .NET is a tool that most .NET programmers know about. It’s actually one of the few freeware tools that is invaluable in a coder’s arsenal. What’s it do? Well, it decompiles any binaries that are assembled in .NET so that you can read it in the .NET languages (C#, VB, IL). It allows you to view the classes, has an explorer function, and allows you to navigate through the source code and such. This is one of the few tools that have been used to find malicious code written into .NET binaries and how some programmers were stealing not only credit card information but also identities.